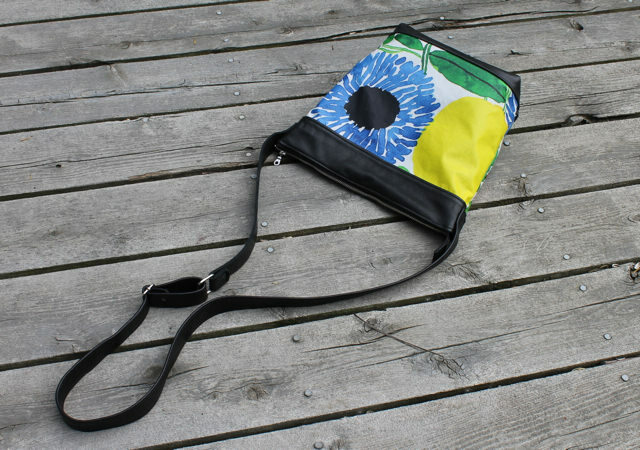 I wanted to make a medium size bag that would be great for everyday use with ample pockets outside and in, cross-body strap for easy wearing and zipper closure. 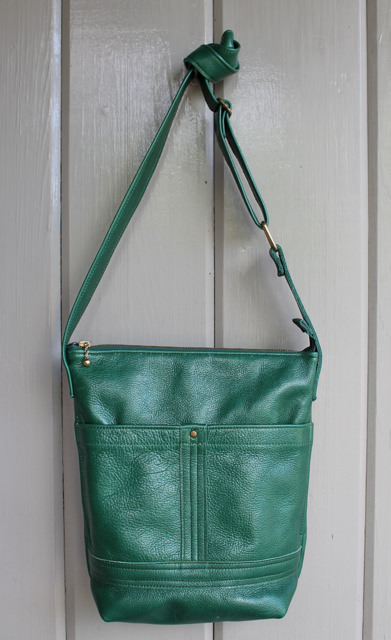 I’ve had a small remnant of this emerald leather for some time just waiting to be turned into a bag. The colour is rich and the quality of the leather is beautiful. 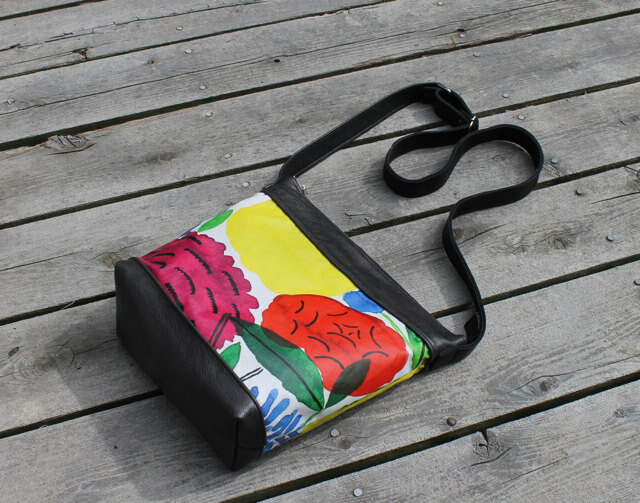 The bag measures 11″ wide, 10″ high and 4″ deep with two outside pockets and three inside, 100% cotton lining, durable metal zipper and brass coloured hardware. It’s ready to add some zip to your day. Check the online store; use the button on the right under Navigation. We are taking a trip through the Hebrides in the fall. This is a location I have wanted to visit for a long long time. My aunt lived in Stornoway and my father’s stories of his visit there intrigued me. I’ve been to Scotland four times. The first time I was 2 1/2 and the last time was about 10 years ago when my sister and I walked the West Highland Way. But it is the northern islands that have always had a sense of magic for me. So I’ve been reading Peter May’s trilogy about Lewis; above is the second book in the series. These books are mysteries but they also beautifully evoke the landscape, the weather and the customs of this rugged land. 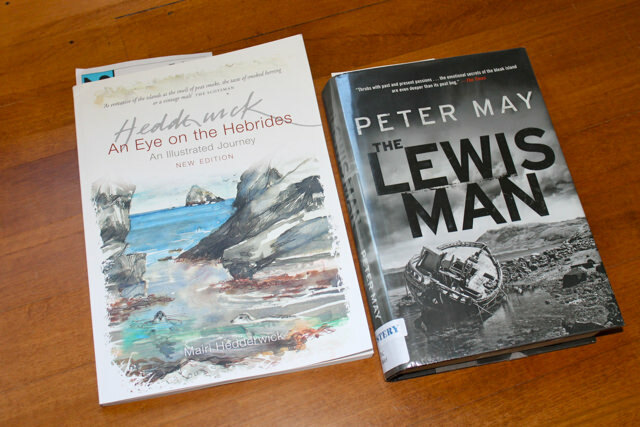 The book on the right is a wonderful sketching tour of the Hebrides by Mairi Hedderwick. She travelled the islands alone in a van and sketched everyday for 195 days! 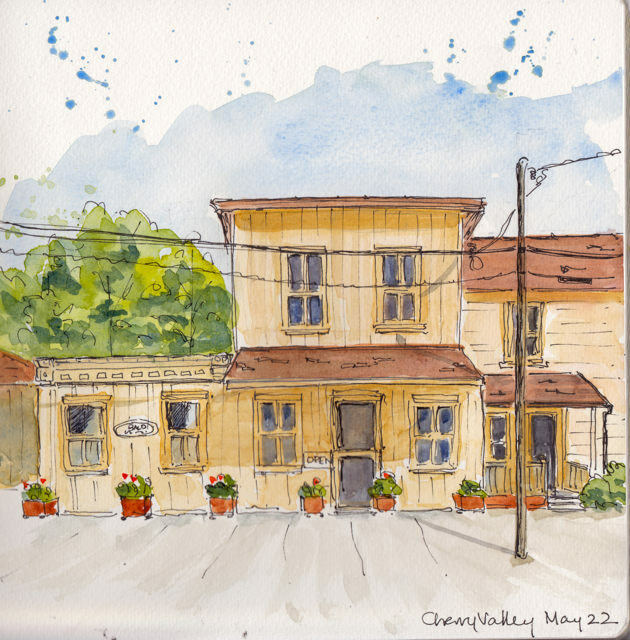 The book is a chronicle of her late 1980’s trip accompanied by lots of her delightful sketches. I am enjoying reading of her experiences on the 40 islands she visited. And although our trip will not be as extensive, I am taking inspiration from her and plan to sketch as much as I can when I am there. 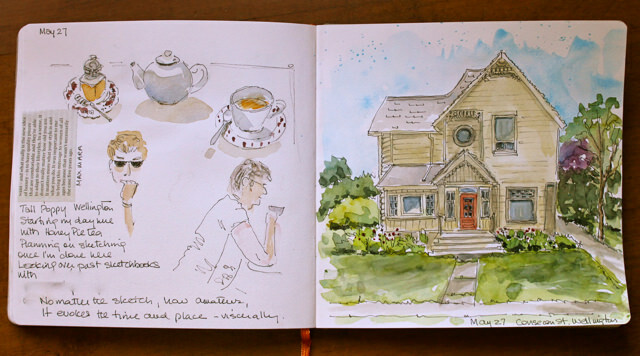 In the meantime, here are a couple of pages of my sketchbook from last week. 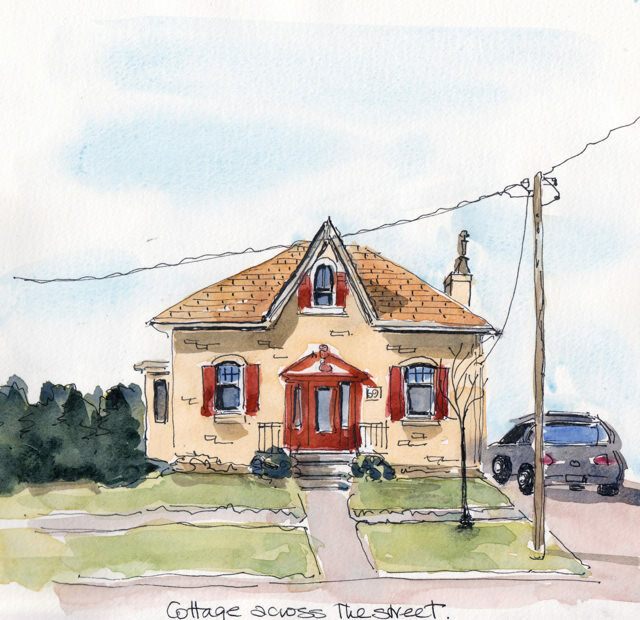 The red house sketch was done standing beside my bicycle and the paint added later. The yellow house was done from the car. Neither position is ideal for getting proportion and line…but they do document the moment. You will see as I decided, I’m including more text and clippings. 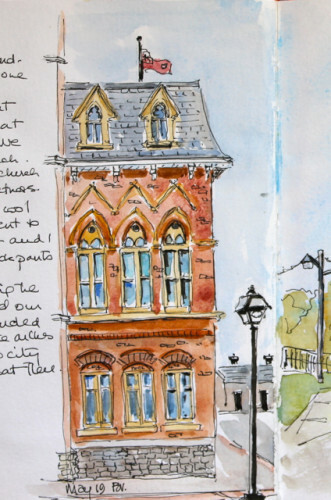 In April, my friend Anne and I went on a sketching trip to Goderich. I posted a couple of sketches here and planned to post the others, but did not get to it until today. Since the start of that trip I have been using the Hand.book Travelogue sketchbook in the 8″ x 8″ size and I like the format very much. 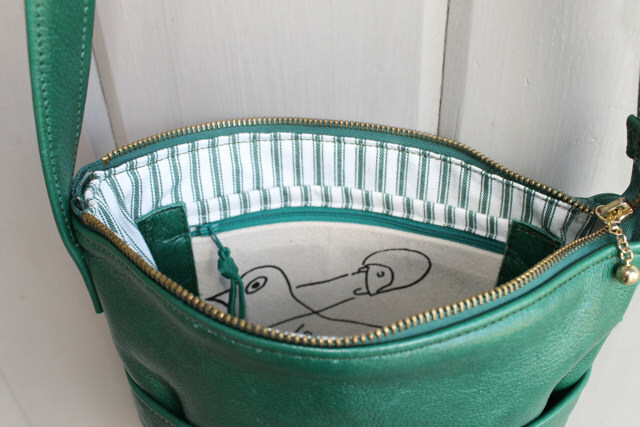 It’s not too big to tote around yet gives ample room so that the sketch does not feel crowded. Below is the Goderich train station. 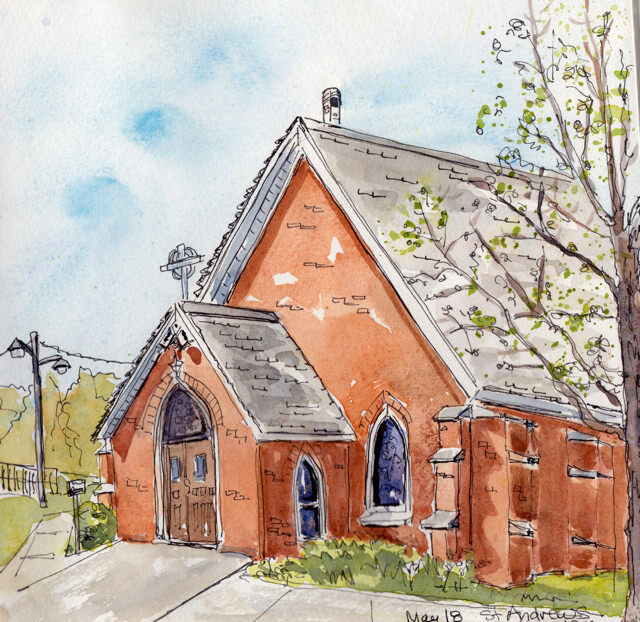 It was a sunny, very cool April day down by Lake Huron and we sat bundled against the wind to sketch this wonderful building. It had been moved from its previous location, because like so many railway stations in Canada, it is no longer in use. But it has been beautifully restored and houses a restaurant now. 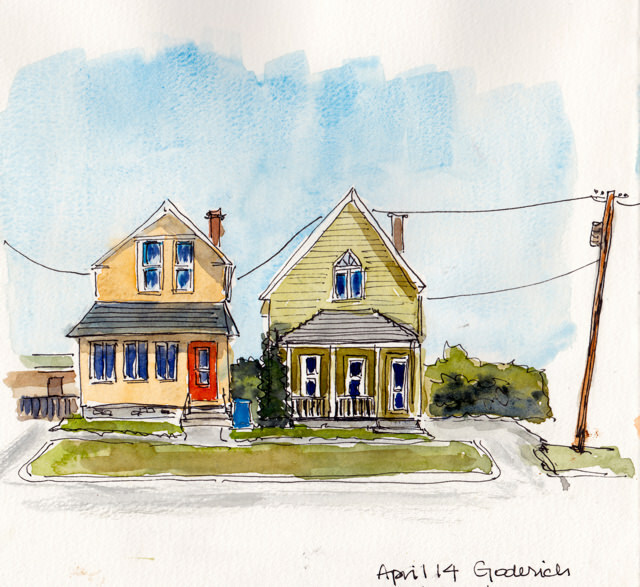 What follows here are some of the cottages on the Goderich streets. You can see I am still working out how to do the windows. It’s an on-going search. The weather was lovely this past long weekend and we spent the day Sunday around Lake Ontario. 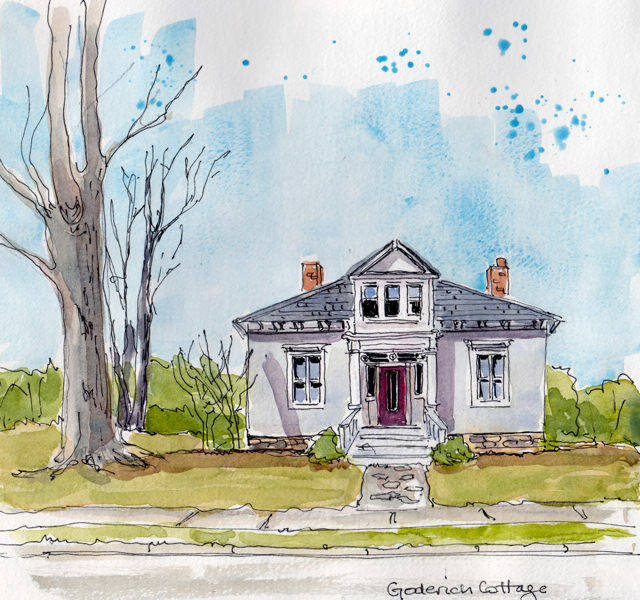 I finished the sketches on site and added the paint once I got home. 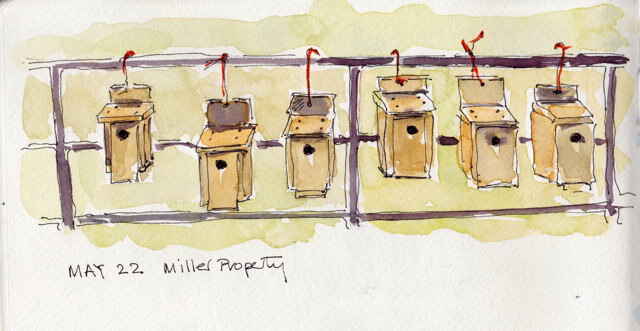 The bluebird boxes strung up on a fence were just too quirky to resist. And the charming building? I stood on the side of the road to sketch–adding paint later. I continue to work on the colour of shadows and foliage. Still, these sketches are a great reminder of a beautiful day. I love this big watercolour print on the Marimekko coated cotton and it makes a great spring/summer bag with reds on one side and blues on the other. 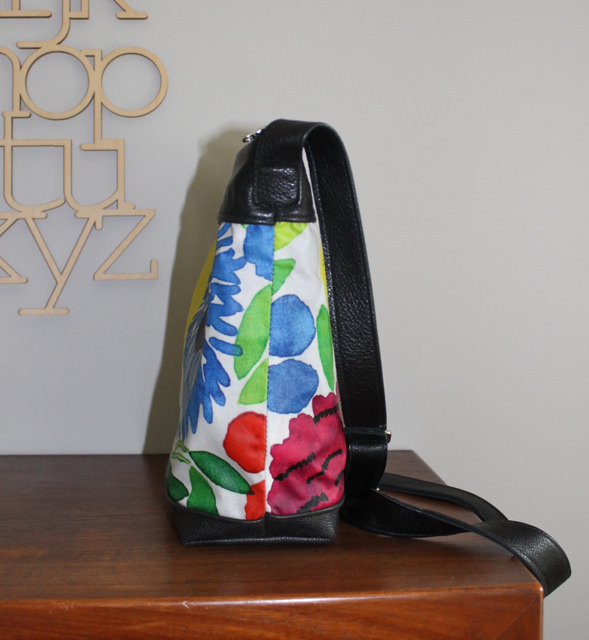 The bag is trimmed in recycled black pebbly leather and has a zipper closure. Inside it has three pockets, a slip/zip double pocket and a red leather phone pocket. 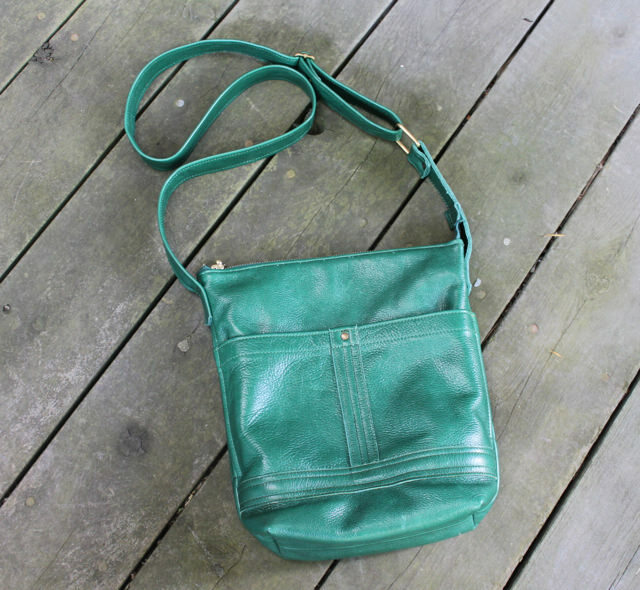 An adjustable leather strap makes it possible to wear cross-body or you can shorten it up to wear on your shoulder. 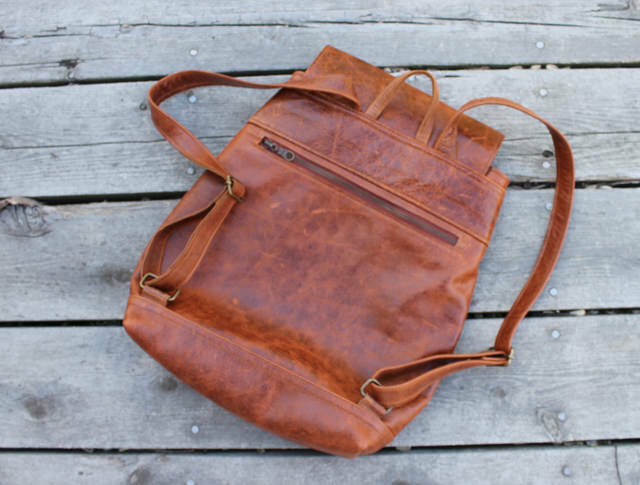 You can take this bag anywhere–it has a durable leather bottom and the cotton wipes clean with a damp cloth. At 12″ x 12″ x 4″ it will carry all you need for these lovely days. 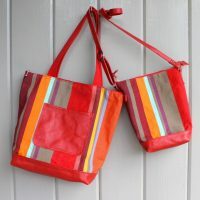 This bag is sold, but it is possible to order one like it as long as the fabric lasts. I’ve been starting to broaden the focus of my sketchbooks. I am still sketching my surroundings and trying to get better at that. That’s number one. But now I am getting back to including other ideas and notes, as well as tickets, notices and print excerpts. I’ve had a journal of sorts since I was 12 when my father made me a varnished wooden box with a lock on it and a C in gothic script painted on the top. And now I want to get back to keeping more of a record. 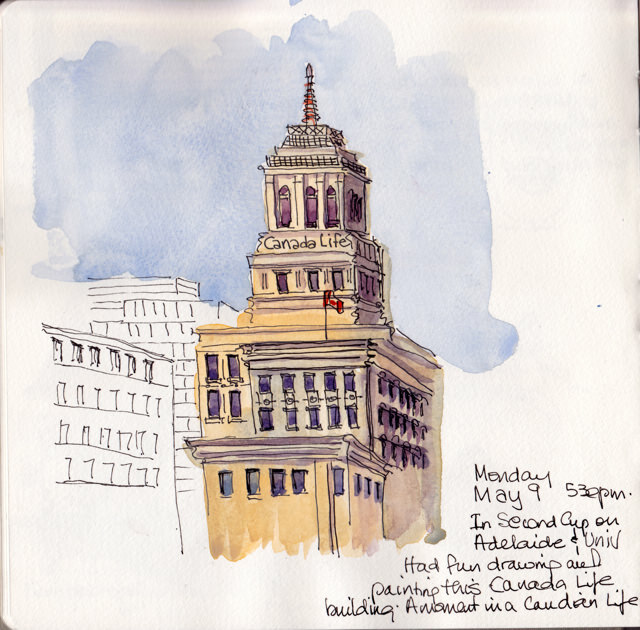 When I looked at one of my first sketchbooks from 2009 I saw the richness of including ideas and excerpts, something that has been missing in my recent books where I concentrate solely on sketching. 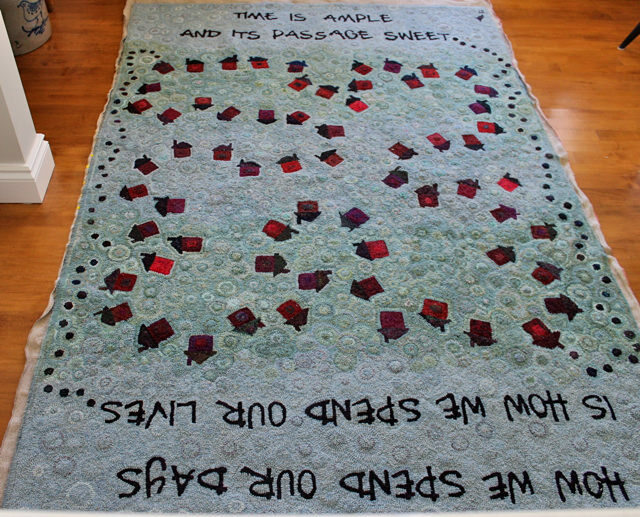 In fact, the idea for my next rug came from some notes and a poem excerpt in that 2009 journal. So I am getting over my notion that I’m ‘wasting’ watercolour paper by writing on it and including extras on my pages. The weather was a bit more spring-like this week and my friend Anne was here for a visit. 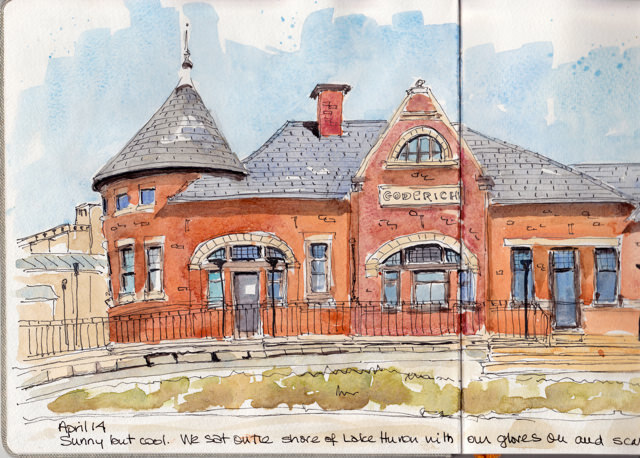 We headed out two of the days to find something in the area to sketch. Our first day was in Wellington on the shores of Lake Ontario. This is the tiny Anglican Church on the main street. My angles are wonky, especially around the front door, but I just went with it, hoping to right it a bit with the paint. Day two was threatening rain, so we sat in the arches across from the City Hall, dodged the rain drops and quickly sketched a wing of that great building. 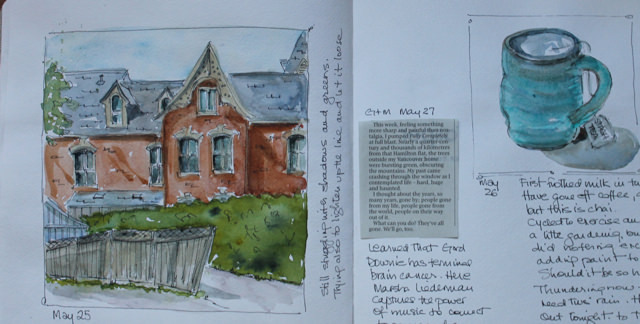 The sketch takes up a small section of the page in my sketchbook but when I look at it, I remember the conversation and the weather and the discoveries I made about a building I’ve been looking at for 30 years. So many reasons to sketch and record. 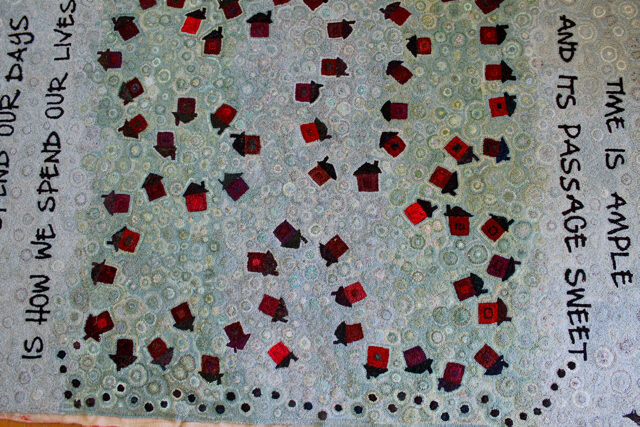 I’m thinking about a new rug now that Annie is almost finished. I fell in love with Wallace Steven’s poetry in university and a recent article on him in the New Yorker rekindled my interest. (He was a complex man, of course, and apparently punched Ernest Hemingway in the jaw and for some time after that nursed a broken hand and puffy eye.) A 2009 journal of mine has his poem Thirteen Ways of Looking at a Blackbird pasted to one of the first pages with ideas for a rug. 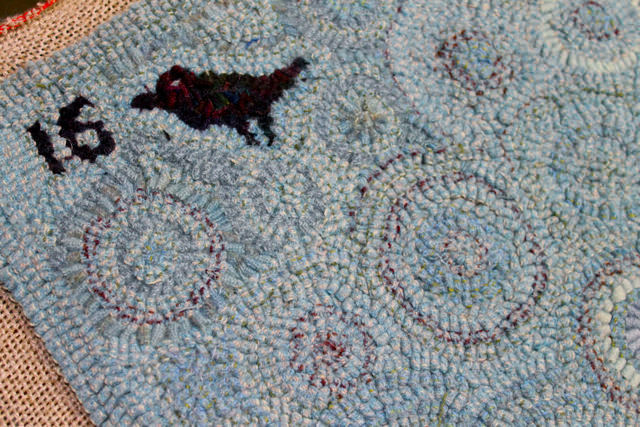 It has been in the back of my mind since then, or maybe before, to do a rug with blackbirds and somehow incorporate part of Steven’s poem. To stir the design process I’ve been reading Bird Brains by Candace Savage. 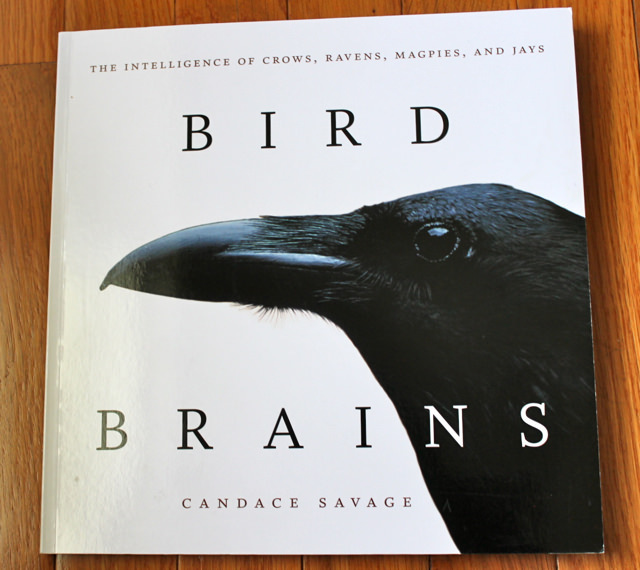 Savage explains that crows, ravens and magpies “are tops among birds for overall brain size. Their brain-to-body ratio equals that of dolphins and nearly matches our own. What’s more their large brains are packed tight with exceptionally large numbers of brain cells.” Her book is filled with delightful tales of Corvids (their Latin name) outsmarting humans and making “complex decisions…showing every sign of enjoying a rich awareness.” I am going to enjoy reading this book and hooking some crows. 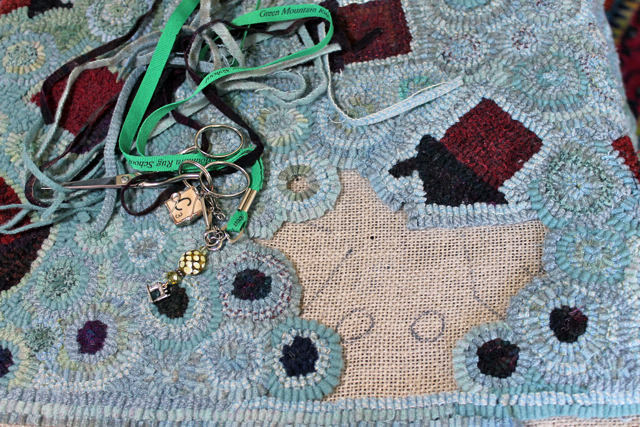 Given the size of Annie, I think I’ll start with a few small pieces, before I tackle another rug. Speaking of Annie..I have finished hooking all 5′ by 7′ of her. Serging around the edge in preparation for whipping proved to be difficult. I am not sure how much she weighs, but it is not insignificant and I had trouble holding that bulk up to the serger. At any rate, here are a couple of photos taken inside. Once the whipping is done, I’ll hang her up and take a proper shot. I stood on a chair and leaned as far out as I could to take this photo–unfortunately I could not stretch to get the whole thing. This photo is taken standing at one end, but it too has its distortion. But you get the idea! One last close-up of the signature. I was in Toronto this week to hear Cheryl Strayed and watch the film of Strayed’s book Wild. Here is an article recounting a different interview on a different continent, but it captures the essence of what I heard on Monday night. Powerful, funny and enlightening. The film was powerful too, but not a patch on the book or listening to Strayed in person. Here is a link to Strayed’s reading list for the hike. Over the two days I was there, I had time for a couple of sketches. The first is at our local train station which you have seen before. It is one of my favourite buildings in the city and I am always happy it is still there as it sits empty these days. 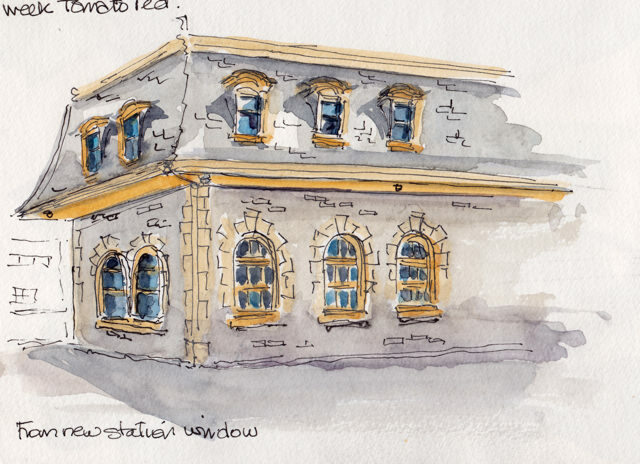 This sketch is from the vantage point of the new station and the perspective was a challenge. I only had the time before my train arrived to do the drawing and I added paint later. 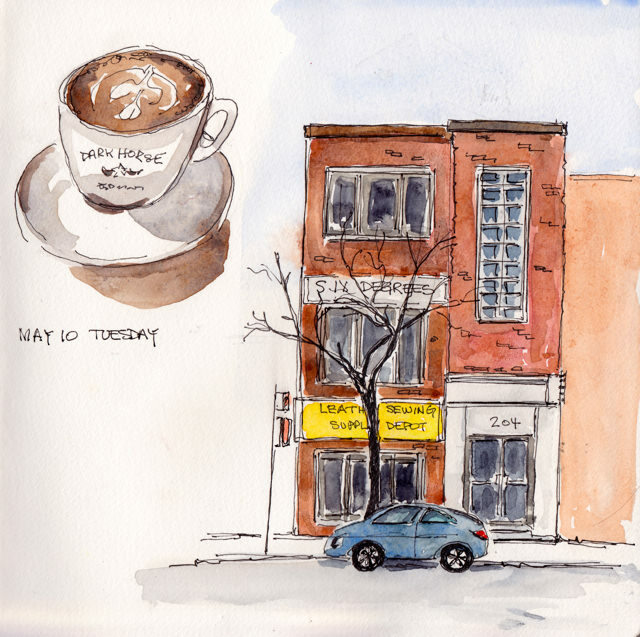 The second drawing was done in a café looking up University Avenue just before going to the film. At bottom is a super quick sketch of a not-very-interesting building. Again it is done from a café the day after the talk. I am often in this café when I’m in Toronto because the building across the road, although uninteresting to look at, is full of all kinds of hardware, rivets, interfacing and zippers I need for my leather bags. I haven’t shared an Annie progress picture for a few weeks. And this will be the last one showing hooking progress. By typing Annie in the search box on the top right you can follow the progress from the start in Wendie Scott Davis’ class in July 2013. 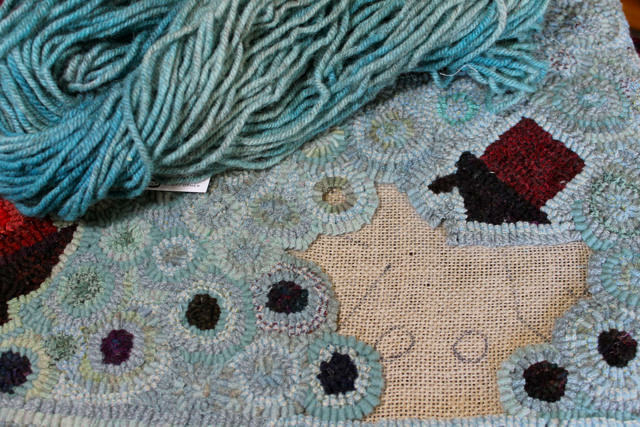 I’ll be taking another class with Wendie this July and starting a new project–but more on that in another post. So, two more dark circles and a little more background and I’ll be ready to start whipping. 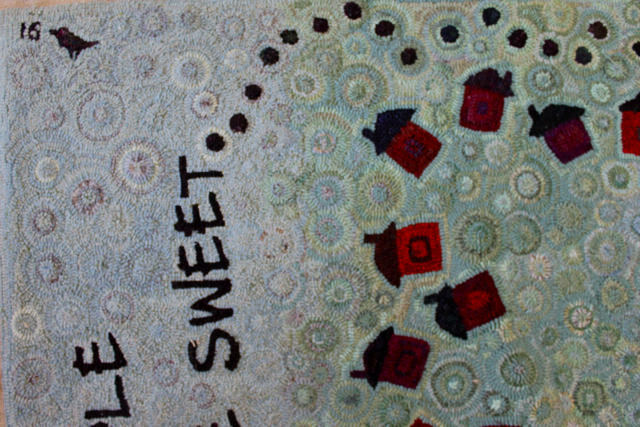 Annie is 5’x7′, so the whipping may take as long as it took to hook the rug–but I hope not!! Below is the lovely hand-dyed wool I bought from Red Maple Ruggery to do the whipping. 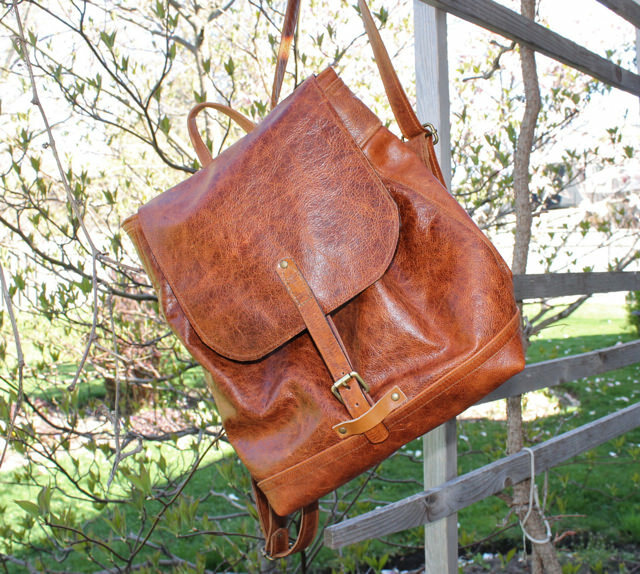 Here is a new backpack in great distressed cognac leather. This one is a special order and is a little bigger: H 13″ W 14″ D 4 1/4″. It is lined in black stain-resistant waxed canvas with a leather draw-string closure and three interior pockets including a zipper pocket and a large leather phone pocket. 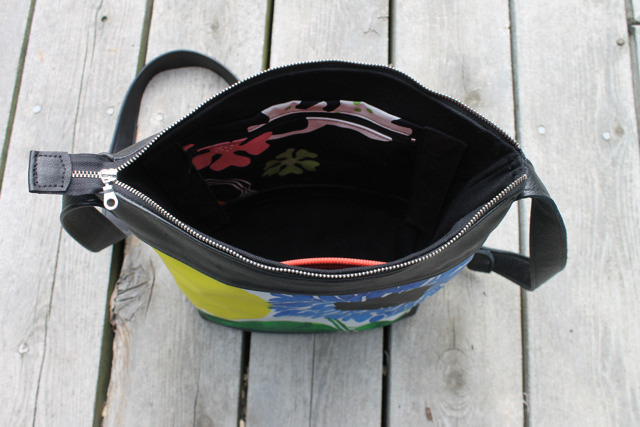 There is an additional large zipper pocket on the back which is completely secure when you are wearing the bag. 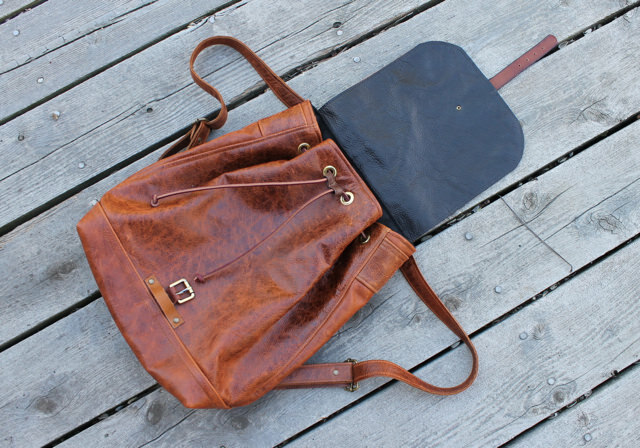 The inside of the flap is lined in recycled black leather and the leather strap is from a vintage belt. I really like the interplay of vintage elements in a bag and try to incorporate them when I can. Overall, this is a great travel backpack which will fit into everyday life with style and utility.